I’ve solved a little Myki mystery. Assume you have paid your daily fare on Myki Money (eg pay as you go), if you load a Pass (eg a weekly or monthly) onto the same card, will the Pass activate immediately, or wait until your daily fare has finished? If it started immediately, you’d be paying twice. Some people had given me various answers, but nothing really solid. I finally got around to testing this scenario. The answer is: it’s okay. It works the way it should. I travelled on Monday morning (31st August) on Myki Money (highlighted in red above), and then took a couple of (non-free) tram rides at lunchtime, which brought me up to the Daily Cap of $7.52. Then I loaded a 32 day Pass (to last from Tuesday, for almost five weeks, to Friday) onto the card (highlighted in blue). After travelling home in the evening, I checked: the Pass had not activated. 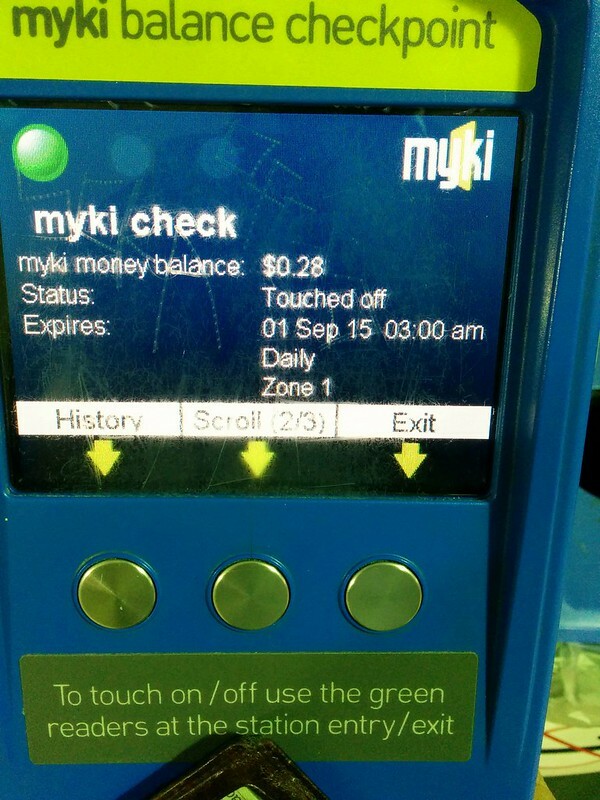 My trip home was under the existing Myki Money fare I’d already paid. It was only when I travelled on Tuesday that the Pass activated. The web site confirms it runs until 3am on Saturday 3rd October (eg the end of the public transport “day” on Friday). Mystery solved. That bit of it works. What’s still wrong with it? …and these types of issues, combined with a fairly rigid anti-fare evasion regime is leading to some well-documented cases of misdirected fines, resulting in some very unhappy passengers. Over the years they have fixed a few Myki problems, such as the ridiculous locking of cards if your Auto Topup failed. But there are still a lot of issues for a ticket system serving such a big city. Thanks for the good news. Touch wood, I haven’t had a problem with my myki in over a year. In fact, I’ve stopped regularly checking transactions online since things are going OK. In that case, LR067_2_065 should be route 67, scanner #2 on tram #65. @David, I didn’t get the number, but it was a B class, not a Z1. A small issue but handy when you fly into Melbourne and can’t check the balanced of an unregistered myki. Not being able to check your card balance using your phone like Opal can be added to the list. Of course this may offend iPhone people. In my experience there is still an issue when adding a pass on the same day when you have earlier travelled on myki money but not reached the daily travel cap. The pass is activated immediately however the money is not returned in the form of a credit – you need to apply for a reimbursement. Maybe an edge case they don’t consider important but I wonder how many people are being overcharged without realising. @Chris, me for one. I’d better ring up about that in the morning! @Anthony, I believe that somewhere in the airport, no doubt hidden away where nobody can find it, is a Myki Machine. @Chris, fair point. The key is to reach the daily cap and then load the Pass. 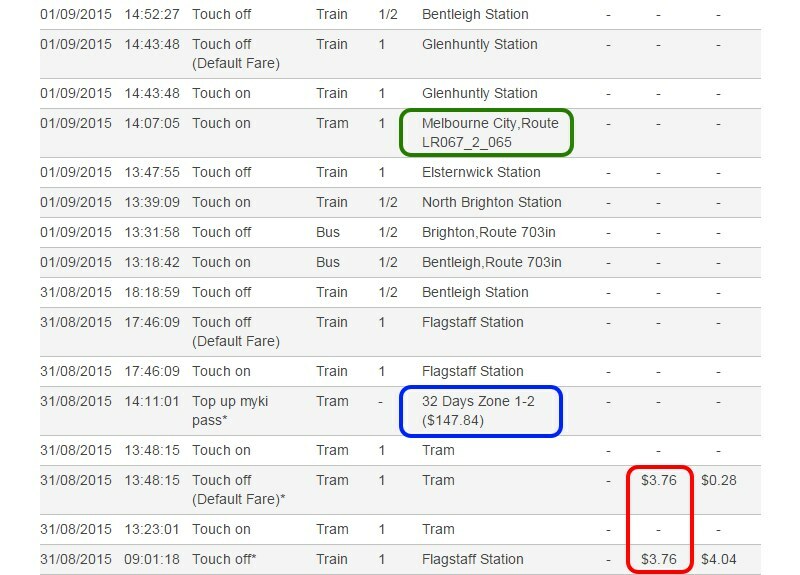 Does anyone know what happens if you touch on for the first time that day, and buy a myki pass at some point while touched on, before touching off? In an ideal world, it would use the myki pass and not charge you any myki money when you touch off, but I’ve never tried. None of this would matter if the system actually worked like a smart ticketing system, and gave you the lowest fare possible, constantly adjusting and refunding as necessary the longer you kept making trips. There would be no need to decide between money and a pass, having to think about when to load which types of credit to ensure the system didn’t rip you off. We would all just load money onto our cards and the system would charge a daily fare if we travelled for one day, then reduce it to a multi-day or weekly fare after we hit several days in a row, then a monthly when we hit a few weeks in a row, and a yearly when we hit enough months to constitute a year. It would refund money to our cards as it went. And this is if we stick to the old idea of daily/weekly/monthly/yearly tickets. Really, the system should be limited only by maths – not by the number of different physical tickets it can sell. If we really set it free, there would be an equation based on the density of our travel days. The more we travelled, the cheaper each journey would become. Such a method is easy with a smartcard system, but for some reason our smartcard system is shackled to our old-fashioned ticket boundaries. @Anthony @Daniel – the T3 myki machine at the airport is on the ground floor, directly ahead of you as you come down the escalator/stairs from the mezzanine/gates level (just to the left of the doors). No idea where the T1 is (don’t use that terminal often enough). Regarding online topup – I’ve had reasonably good results in testing it with “picking up” the topup at train stations where the devices are “on-net”. The quickest was about 30 minutes (I wouldn’t ask for any better), and the slowest (when I’ve been paying enough attention to notice it) was about three hours. Trams and buses would be a whole other kettle of fish, and I haven’t tested those at all. I’ve missed the myki machine at T3. But then again I’m usually on Jetstar (T1) or Tiger (T4 & a looong way from the bus stop). I used the machine at Melbourne Airport T2 (International) last night – it backs onto a wall that’s roughly adjacent to the windows to outside, at the northern end of the arrivals hall near where it borders with T1. My receipt number was “004” so hopefully that’s not the total tally of people who have used it. I knew this and have used this quirk several times. Apologies for not being aware that you were looking for that information. It also works if you have almost finished travelling for the day, even if you haven’t hit the daily cap. That is to say, touch on -> touch off. Buy pass. Do another trip within the 2hr window. But I guess, for the people who find it too complex … carry two cards (travelling on a temporary one for now, load pass onto your other/normal one for tomorrow). No, it will swipe your money. An unintentional case came to light in the media some time ago, where the CVM (machine) clock was running fast. In absolute terms, the passenger bought the pass, then touched on. But the system had it recorded as touched on first, then bought the pass. They’re too stupid to run NTP. Situation: you suspect your card is still touched ON from some previous trip, and want it touched OFF without incurring further travel cost. Method: At a railway station, touch ON, wait 30 seconds, then touch OFF (within 15 minutes). Result: Change of mind, no charge. It will square up a default fare as applicable, and leave the card touched OFF. It should also put any Myki pass back to sleep. Question: Not sure if it works on a card, after its 4-year expiry. Ensuring your card is touched OFF sidesteps several issues – getting it replaced on-the-spot, knowing the true balance of the card, and avoiding a problem of default fares being charged at the new price when there’s been a price rise since. It should be no different to when you load a second pass onto the MyKi while the first one is still in effect. The system was meant to function in the way that, you could have a second pass loaded into the card, ready to activate once the previous one expires. It should be the same when the current pass is a daily one as you said above.